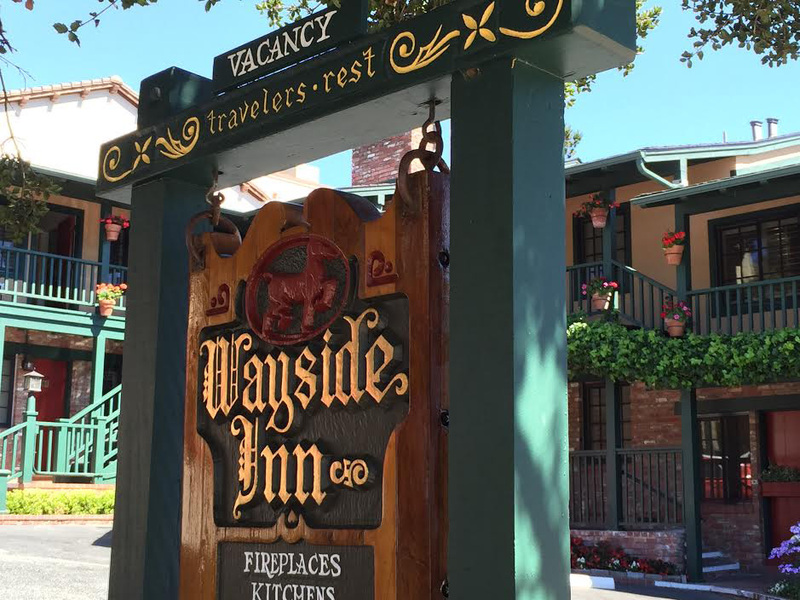 The Wayside Inn will charm you with lovely guestroom options when you call 831-372-5000 Reservations Agent with fireplaces, suites, jacuzzi, patio and kitchen choices to make your stay wonderful. With all the amenities you would like simply made by choosing the one you like best and it will be booked for you! Picking out a romantic room for a couple, a suite for a family and a kitchen room for the foodie will make your stay in the village even better as you have reserved the best room. You're going sleep well in comfortable king and queen size beds and wake up refreshed and ready to enjoy your day in Carmel! A Carmel Comstock brick building laced with ivy and hanging flower baskets. The Wayside Inn is located in the heart of the Carmel by the Sea village within walking distance of shops, boutiques, artist studios and wonderful restaurants. Roam the shops area filled with boutique and specialty shops, fine art and the artists’ studios, jewelers and garden shops. Walk to one of Carmel’s fine theaters checking to see what may be playing while you’re in town! All of the rooms have amenities like refrigerators, coffee makers, irons and TVs. Complimentary continental breakfast and the newspaper are delivered to your door each morning enabling you to sit and relax a bit. There are romantic rooms for couples Suites have living room with fireplace separate from king bed in bedroom and some have a full kitchen. There are king bed, fireplace jacuzzi suites available. Some suites have two baths and for your family’s convenience some have kitchenettes. Parking is provided for each room and it’s on property. You’re thinking positively if you wish to host your next special event and meeting in Carmel by calling 831-372-5000 for free event planning service to obtain a competitive room rate for a room block at this lovely and well located inn. Local knowledge will be invaluable in helping to creating what you envision for your most special occasion and gathering. Guests will be delighted with a stay at this inn with all of their loved ones and friends together in the town center and an easy walk to the beach for get togethers while watching the sunset. A real Carmel tradition!